A bit of red and green garnish turns almost anything into holiday fare. Since so many of our foods are white or beige, they can use a colorful lift. While a baked brie topped with cranberry relish and rosemary is a holiday staple in our home, we love garnishing other foods with crisp, flash-fried herbs. Try it: You’ll discover a colorful, flavorful garnish that can be added to just about everything. And, it takes less than a minute to cook the cleaned herbs. Basil, parsley and sage can be flash-fried as a tasty garnish. 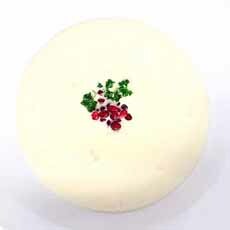 Combine them with a red garnish for a Christmas effect. 1. WASH, pat dry and pinch the leaves from the stems. 2. HEAT the oil in a small skillet over medium-high heat. When hot, fry 6–8 basil or sage leaves, or equivalent parsley, at a time until crisp, 2–3 seconds. 3. TRANSFER the herbs to a paper-towel-lined plate. Sprinkle with coarse salt and set aside until ready to use. A white soup or any white food—goat cheese, chicken breasts, fish, mashed potatoes, noodles, grains—gets a lift from pomegranate arils and fried herbs. Here, parsley is flash-fried (photo courtesy Chef Adrianne). 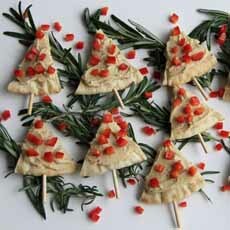 Cut pita rounds into triangle “trees,” and add a wood toothpick for the stem. Top with hummus and garnish with a small dice of red and green bell pepper. For more color, buy green hummus, or blend thawed green peas into regular hummus (photo courtesy Tribe Hummus | Facebook). 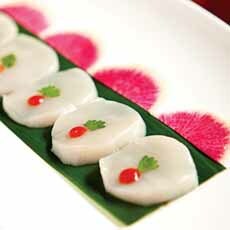 Raw sea scallops are a favorite of ours. Serve them atop a slice of watermelon radish, or plate them as a first course as shown. Garnish with a bead of salmon caviar or an dab of chile sauce, plus a leaf of parsley (photo courtesy HMF | The Breakers).